Emerging technologies that draw from biomedical technology, nanotechnology, information technology and other fields are developing at a rapid pace and may lead to any number of ways people might be able to “upgrade” themselves. Such technologies, in the pipeline now to address medical and therapeutic needs, could produce new ways for humans to push the boundaries of their abilities, making their minds sharper and their bodies stronger and healthier than ever before. But a new Pew Research Center survey shows that majorities of Americans greet the possibility of these breakthroughs with more wariness and worry than enthusiasm and hope. The Center’s study focuses on the U.S. public’s reactions to three emerging technologies that could fundamentally improve people’s health, cognitive abilities or physical capacities. The specific examples were gene editing to give a healthy baby a much reduced risk of serious diseases and conditions over their lifetime; implanting a computer chip in the brain to give a healthy person a much improved ability to concentrate and process information; and a transfusion with synthetic blood to give healthy people much improved speed, strength and stamina. These are but three of many enhancements scientists and bioethicists say could arise from biomedical technologies now under development. They were chosen to capture the range of enhancements on the horizon. All are tied to breakthroughs unfolding in labs, such as CRISPR for gene splicing or the Human Connectome Project for brain science, and these developments are intensifying debates about the uses of emerging technologies. None of the techniques behind these ideas is being used for “enhancing purposes” today, although all exist in some form of development for therapeutic or medical applications. They each raise potentially enticing prospects: What if we, as a society, could virtually do away with illness? What if humans could all raise their thinking capacity manyfold? And what if synthetic “super blood” could boost physical prowess to “superman” and “superwoman” levels? Majorities say these enhancements could exacerbate the divide between haves and have-nots. 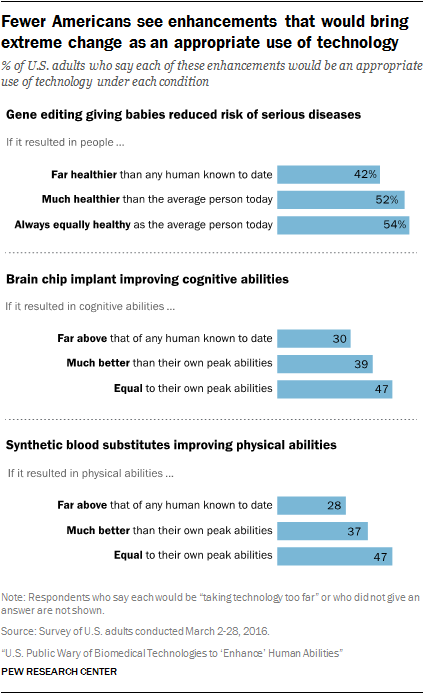 For instance, 73% believe inequality will increase if brain chips become available because initially they will be obtainable only by the wealthy. At least seven-in-ten adults predict each of these new technologies will become available before they have been fully tested or understood. Though each of these potential enhancements raises unique social and ethical implications, the public’s views about the three enhancements have similar contours. Technologies that would bring more dramatic or extreme changes to human abilities are generally less acceptable to the American public than are technologies that cause less dramatic or temporary changes. For example, 47% of Americans consider the use of synthetic blood substitutes to improve physical abilities an “appropriate use of technology” if the resulting change to people’s speed, strength and stamina would be “equal to their own peak abilities.” But if the same enhancement results in physical abilities “far above that of any human known to date,” far fewer (28%) say it would be an appropriate use of technology. 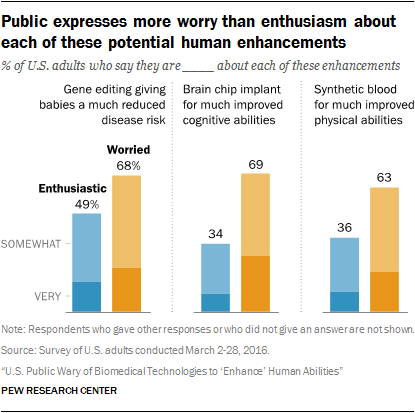 The same pattern occurs as Americans consider the potential use of gene editing and devices implanted in the brain to augment human abilities. People’s reactions to these enhancements are more positive if the effects are controllable or temporary. For example, 51% of U.S. adults say that a brain chip implant would be less acceptable if the effects were permanent and could not be reversed. 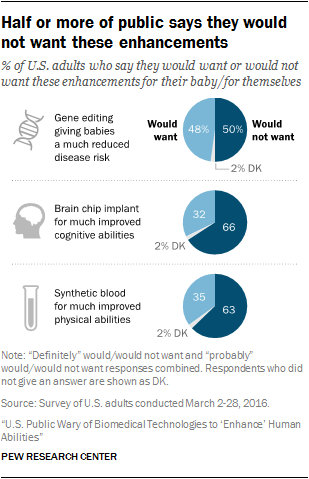 And when asked about the possibility of gene editing giving babies a much reduced risk of serious disease, some 49% of adults say this would be less acceptable if it changed the genetic makeup of the whole population. People’s views also differ depending on how religious they are. 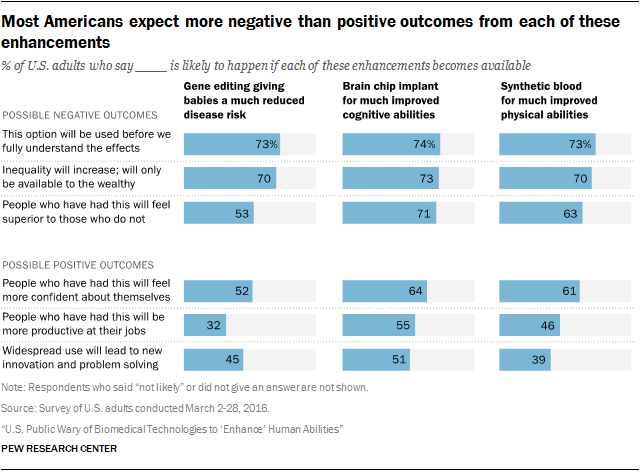 More religious Americans are, on average, less affirming of these enhancements. People high in religious commitment are less likely than those low in religious commitment to want each of these three potential enhancements. 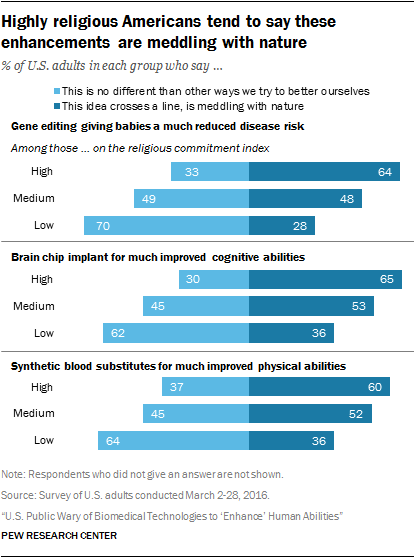 And six-in-ten or more of those high in religious commitment consider these enhancements to be “meddling with nature” and crossing a line that should not be crossed (gene editing 64%; brain chip implants 65%; and synthetic blood 60%). By contrast, majorities of those low in religious commitment are more inclined to see the potential use of these techniques as just the continuation of a centuries-old quest by humans to try to better themselves. Wide differences by religion about cutting-edge technologies and scientific developments are by no means a given. For example, a 2013 Pew Research Center survey on another form of enhancement – technologies that could slow the aging process leading to radical life extension – found much more modest differences by religious service attendance and religious affiliation. And in a 2014 Pew Research Center analysis there were only a handful issues where people’s religious beliefs and practices had a strong connection to their views across a range of some 22 science-related issues. Developments in biomedical technologies are accelerating rapidly, raising new societal debates about how we will use these technologies and what uses are appropriate. Gene editing is but one example where the pace of scientific breakthroughs behind the techniques is prompting a new urgency both within the scientific community and the broader public to consider the social, ethical, legal and policy implications ahead.